Maxibright Digilight Pro "Max" 400v 600w adjustable Ballast. Produces 10% more PAR output, now you can use 400v pro lamps indoors! 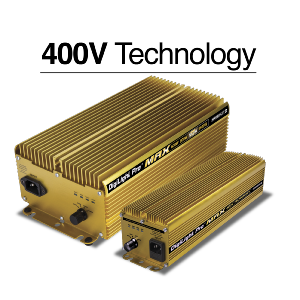 The new maxibright pro max gold digital ballast has the same great features as the original maxibright max output ballast plus the additional added benefit of now running 400v bulbs it can also run 240v bulbs, so you can use your 240v 400w metal halide bulbs for the veg period and then auto switch to your 600w 400v flowering bulbs! The Maxibright DigiLight Pro® Max Gold is the latest in digital ballast technology, allowing you to power the new high PAR output 600W 400V glasshouse system lamps in your grow room from your domestic 240V supply! This gives you 10% more PAR output per watt than a conventional HPS lamp which means you achieve more usable grow light for your plants. One lamp, 4 power modes: 400W/500W/600W and 660W super power mode. Gradual dimming/boost for lamp protection. Surge Control® software: when multiple DigiLight Pro® Max power packs are started from the same power supply they will ignite your lamps one at a time to reduce electrical surges. Soft start technology gently starts the lamp with a low current. Fast lamp re-strike to limit the damage caused by unexpected interruptions such as a power cut. Dynamic frequency control for regular ballast output when your supply fluctuates. LED status light with diagnostic feature. LED is off at night for no disruption to plant cycle.